In this chillingly memorable tale, Henry James employed his trademark subtlety and ambiguity to create a masterpiece of double meanings. The novel is written in a strangely complex form; a narrative by a governess, which is introduced by another narrator, who recounts the story to a party of house guests. Through all the twists and turns of the plot, the brooding sense of ghostly evil and menace deepens until the final crisis point is reached. Even then, the difference between truth and illusion is impossible to discern. 1. OLD MEMOIRS. At a house party, the host, Douglas, tells him guests about meeting a governess, whom he found attractive, and how she confided in him. Then the reading of her memoirs commences. She is bowled over at meeting her prospective employer in his grand Harley Street house and, despite initial qualms about rural solitude, agrees to take on the post of governess at Bly, the country house that is home to his two wards. When she arrives, however, Bly appears delightful. She also likes Mrs Grose, the housekeeper, and Flora seems enchanting. 2. ENCOUNTERS GOOD AND BAD. The governess's joy is blighted by a letter from Miles' boarding school, which announces that he has been expelled. She consults Mrs Grose, who declares that he must be innocent. The governess learns a little about the fate of her predecessor, but all is forgotten in the excitement of Miles' arrival. He is even more delightful than his sister. One evening, wandering in the garden, the governess sees a strange man at the top of the tower of the house and assumes that he must be an intruder. 3. EVIL APPARITION. About to go out one day, the governess sees through the window the face of the man she first noticed at the top of the tower. She rushes out but cannot find him; instead she startles Mrs Grose. The housekeeper is stunned by the governess's description of the intruder, which matches that of Peter Quint, the master's former valet. This devious, evil man had been in charge of Bly - and has since died. 4. A WOMAN IN BLACK. Valiantly, the governess vows to protect the children from the ghost's evil intentions. In the days that follow, she learns that Quint died in the suspicious circumstances on the way home from an evening's drinking. She boldly continues with her plan to screen the children from him. Then, while out in the ground with Flora, the governess sees a women dressed in black gazing fixedly across the lake at the child. She is oppressed by the sense of evil the woman radiates and is alarmed that Flora seems to be pretending not to have seen her. When she next sees Mrs Grose, the governess tells her that she is sure it was Miss Jessel that she saw and learns that her predecessor was thought to have borne Quint's child. The governess is convinced that the children are aware of both Miss Jessel's and Peter Quint's ghosts, and soon after meets Quint again - this time inside the house. 5. INNOCENCE CORRUPTED. Woken by Flora getting up in the night, the governess sees her staring out of the window at Miles, who is on the lawn looking up at the house. When the governess brings him in, he tells her that he did it just to show how 'bad' he could be. 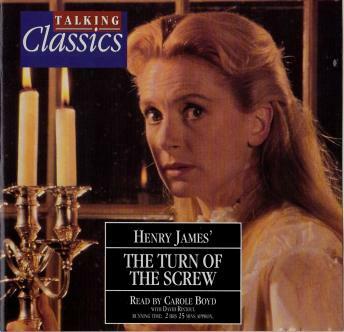 She is baffled by his admission, but tells Mrs Grose her suspicions; that the children are regularly in contact with Quint and Miss Jessel and have already been corrupted by them. She decides to write to her employer, but before she posts the letter, Miles charms her completely by playing the piano for her. 6. LAKESIDE DISASTER. Realising that Flora has gone out alone, the governess goes to Mrs Grose and the two set out in pursuit. They find her on the far side of the lake, totally unconcerned. When the governess confronts her, asking her where Miss Jessel is, the ghost suddenly appears. Triumphant, the governess points her out, but Mrs Grose cannot see the ghost. Flora cannot -or will not - see Miss Jessel either and she turns violently against her governess. Mrs Grose takes the distraught child back to the house, leaving the governess alone with grief and horror. 7. DEPARTURE FROM BLY. Back in the house, Miles comes to the governess and sits wordlessly with her two hours, as if about to disclose a secret, but he remains silent. The next morning, Mrs Grose wakes her with the news Flora is ill with a fever and is deliriously abusing her in language she should never have known, which confirms the governess's fears that the children have been influenced by Quint. Mrs Grose takes Flora away to London and reveals that the letter the governess wrote to their employer, and left on the hall table to be posted, has been stolen - obviously by Miles. She believes that theft was the reason for his expulsion from school. 8. FINAL CRISIS. Alone with Miles, the governess is determined to force him to tell her the truth about the stolen letter and his crime at school. The instant she questions him, she sees Peter Quint's ghost appear at the window. Miles confesses that he took the letter and was expelled from school for the thing he had said. He is unable to see the ghost although he looks for it desperately. The governess clutches him in her arms, believing that his confession means he is at last free of Quint. Her triumph however is short-lived, for his heart has stopped.